Amelie (Le fabuleux destin d’Amélie Poulain in French), directed by Jean-Pierre Jeunet, became a French classic with worldwide fame. The romantic comedy shows the history of Amélie Poulain (Audrey Tautou), a waitress in Montmartre who keeps watching the people around her. She aspires to do some good around her and finds a small toy box and decides to find its owner. On her way, she will meet many characters, always with Yann Tiersen music as the original soundtrack, and she will go through many places in Paris you must visit. If you already know this movie, get ready to follow Amélie Poulain’s steps. If you don’t, watch it before you even read this article, and you shall see a difference in these mythical places. In the movie: Amélie Poulain goes there every year with her mother to burn a candle to ask for a little brother. One day, as they leave the church, a Canadian tourist jumps off the roof and kills Amélie’s mother on the spot. Today: Notre-Dame de Paris is one of the most visited monuments of Paris and Europe. It was inaugurated in 1345, it was for a long time the highest building of the city, and it was part of the History of France on several occasions. You can find it on the île de la Cité (4th district) and admire the architectural early Gothic and rayonnant styles. The entrance is free throughout the year and guided visits (for which you must pay) are organized to go to the roof of the Cathedral. Enjoy the view of Paris! In the movie: Amélie Poulain goes down this street every day. She is a waitress at the Café des 2 Moulins. She also goes there to go to the grocery or other shops. One day, she helps a blind man to cross the street and describes to him the street, the people, the horse butchery, and many other details. Today: Time has passed since the movie was shot and one thing or two things have changed in the street. But you still can find the groceries, the butchery, and the Café des 2 Moulins with traces of the movie’s shooting, though Georgette’s tobacco corner is gone. You can enjoy a crème brulée there and break its top with your teaspoon just like Amélie does in the movie. In the movie: Amélie takes the train there some weekends to see her father in Enghien-Les-Bains, where she grew up. 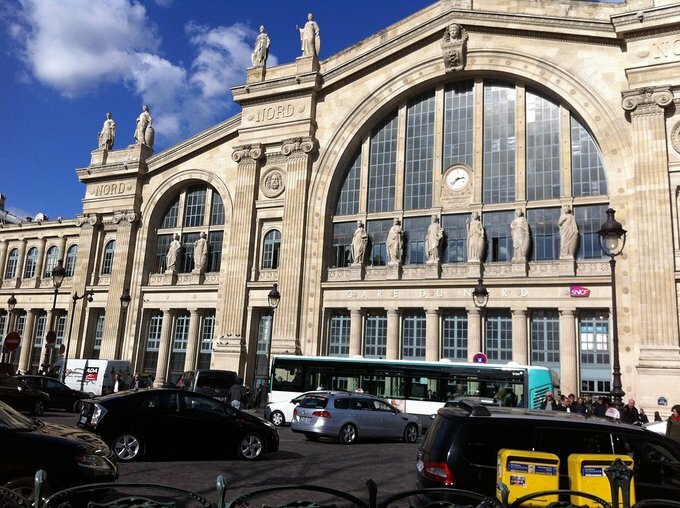 Today: The Gare du Nord leads to the North of France and the northern countries. The Eurostar goes to England and the Thalys is bound to Belgium, Germany, and the Netherlands. It is the first European station considering traffic and the second according to user’s flow capacity. It opened in 1846 and received in 1975 the title of historic monument. You may find many restaurants and hotels around the station, allowing you to regain strength before you resume your journey. 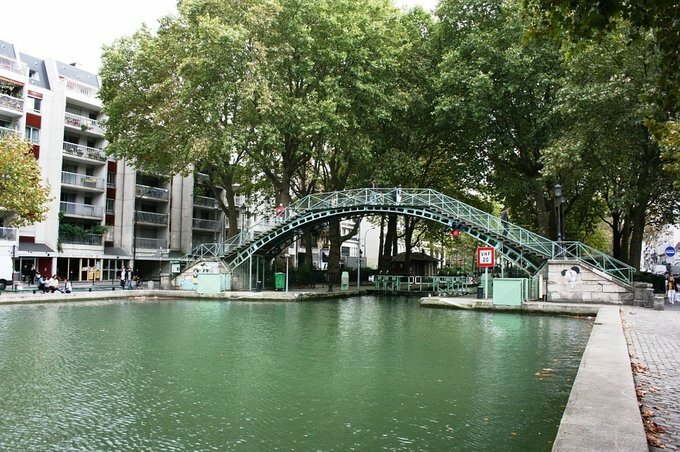 The Canal Saint-Martin – 10th and 11th districts. In the movie: Amélie usually goes there to do some stone skipping. Today: This 4.5km long canal connects the La Villette basin to the Port de l’Arsenal. It was inaugurated in 1825, and its purpose was to take drinking water to Paris. It has been a historic monument since 1993 and Parisians can enjoy it as soon as the sun comes up. You can enjoy a drink or do some stone skipping like Amélie Poulain. It was entirely cleaned in April 2016 and looks brand new. Swimming should be authorized by next summer. 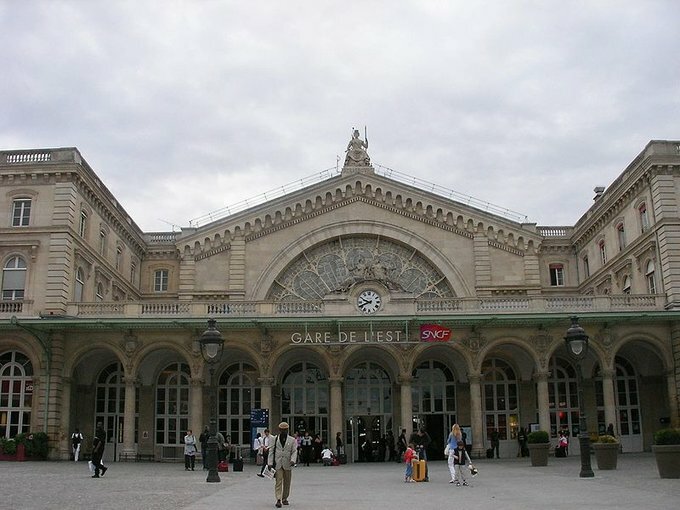 In the movie: Amélie Poulain lives near this station, and most of the scenes take place in its surroundings. Today: Lamarck-Caulaincourt station opened in 1912. Through metro line 12, it is connected to the Place de la Concorde, the National Assembly, and the Saint Lazare station. Near the station, you can take a walk in Montmartre, just like Amélie, and visit the Museum of Montmartre, Saint-Vincent graveyard, and all the other secrets of this authentic quarter. In the movie: A few yards away from Amélie’s home is this grocery, where she stops to chat and listen to the neighborhood gossips. Lucien (Jamel Debbouze), the young employee, is a simpleton mocked by his boss, but Amélie learns to like him and hates his boss. She goes as far as to break into his home with the keys he had forgotten. 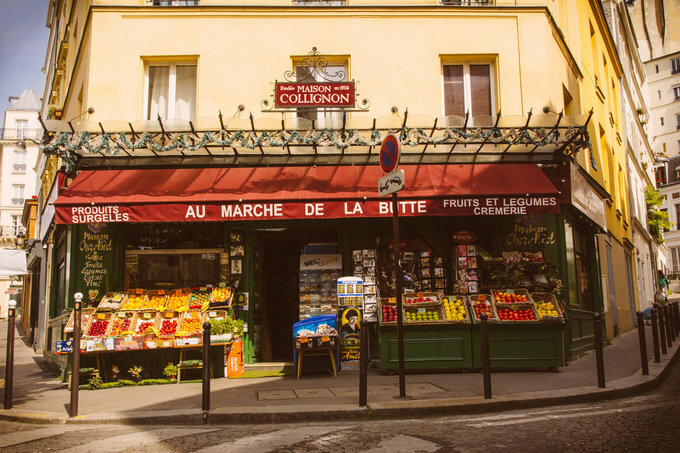 Today: You can still find the grocery on the street angle and it used to be called “Chez Ali” before it took the name “Maison Collignon” the film gave him. It sells fruits, vegetables, and other foods, as well as souvenirs from Amélie Poulain. It is stuffed with press articles about the film’s success, which should please the nostalgic ones. Amélie’s home might be in the building behind the blue door. In the movie: Amélie fell in love with a simple but quite intelligent man. At the moment, he likes to collect photos of strangers from the photo booths. Amélie finds the book where he keeps all of them and goes to the Foire du Trône funfair, where he works, to go on a merry-go-round and date him. 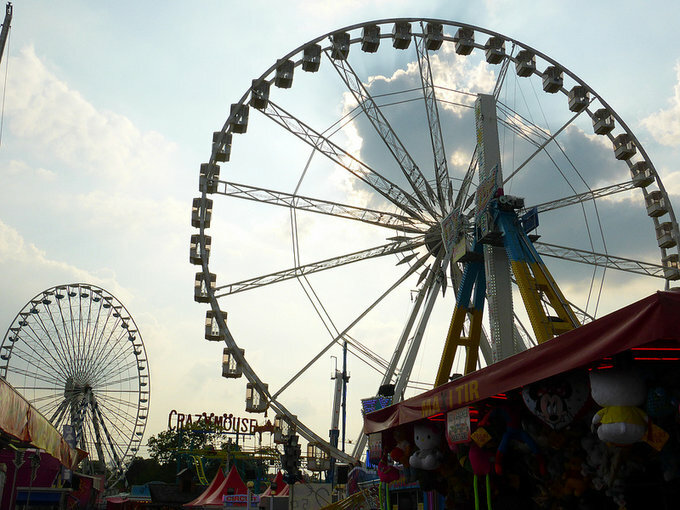 Today: The Foire du Trône is the biggest travelling funfair in Europe. It takes place in the Bois de Vincennes every year between April and May. Since it was based in Vincennes, it did not stop growing and now counts more than 55 attractions. It was originally called the “Foire aux pins d’épices” (the gingerbread funfair) because it allowed the Saint-Antoine abbey (now the Saint Antoine Hospital) to sell gingerbreads during the Holy Week since 957. The idea became popular and commercial, and the “Foire du Trône” was born. In the movie: Amélie gave a rendez-vous to Nino, the young man she is in love with, near a phone box, at the bottom of Montmartre’s hill. 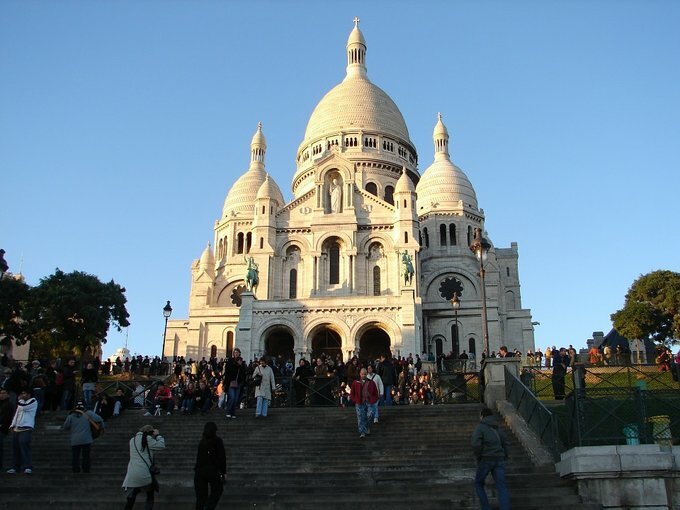 She set up a treasure hunt to have him climb the stairs up to the Sacré-Coeur. Today: Montmartre’s district is one of the most historic of Paris. 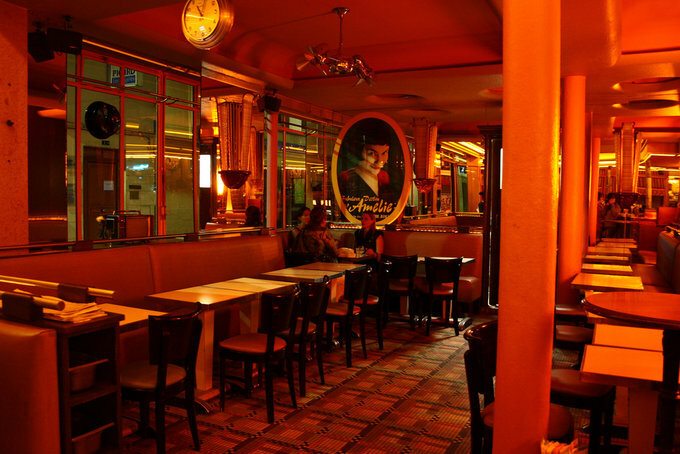 If you want to lose yourself in the authentic Paris of yore, this is the place to be. If you have stamina, you can even climb on foot the 222 steps to Montmartre’s village and the Basilica. If you walk around, you may find most of the places we talked about and, from the Sacré Coeur, you will have an astonishing view on Paris. In the movie: Amélie Poulain goes there to use a photo booth, and Nino Quincampoix takes the photos for his private collection. The hall we see the most is called Salle des pas perdus, where the photo booth is. And if you’re more interested in the movie « Paris, je t’aime », check this article !